Editor’s Note – Spring is quickly approaching! Are you prepping your garden for the spring planting season yet? This article has everything you need to know. This infographic + article were originally posted on FIX.com and written by Laura Newcomer. If you’re starting a new garden, choose a plot of land that maximizes your chances of a successful harvest. Choose a location that is fairly level, near a water source, and protected from intense winds. It should also have adequate drainage and receive at least six hours of direct sunlight every day.1 Test the soil to learn about its nutrient composition so you can amend it properly (more on that later).2 Learn more about how to reclaim neglected land for a garden here. In the rest of this article, we’ll assume you’re working with an existing garden. Many plants won’t grow well (or at all) if you simply put seeds directly into your garden’s soil.5 The solution? Start growing from seed indoors in the weeks leading up to spring, and then transplant the small plants into the garden when they’re ready to thrive. Alternatively, you can purchase starter plants from local farmers or greenhouses right before you’re ready to plant. After the seedlings germinate and the first true leaves appear, repot any seedlings that have become crowded.17 Keep them exposed to a consistent supply of light until you’re ready to transplant them into the garden. Again, research your plants’ specific needs to determine the amount of light exposure that will work best. 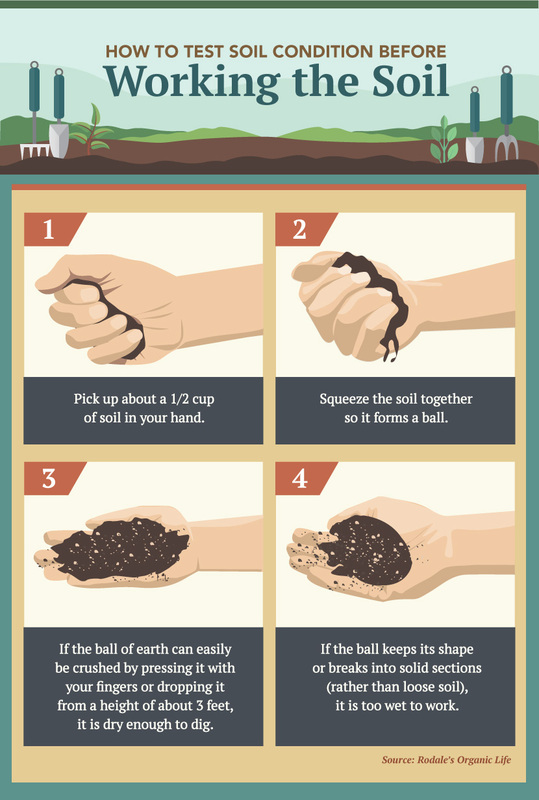 Once the soil is dry enough, you’re ready to break it up. If you planted cover crops, be sure to start working the soil several weeks before planting in order to mix in the cover crops so they have time to decompose in the soil.20 If you didn’t plant cover crops, start by removing weeds and other dead plant matter; you can choose to compost these or mix them into the soil.21 Whether you used cover crops or not, be sure to use a broad fork to break up the soil so it’s more hospitable to new plantings. “Amending” the soil is just a fancy way of saying “add whatever you need to in order to create a nutrient-rich environment for plants.” While synthetic fertilizer options abound, your soil and the surrounding ecosystem will be much healthier – and stay that way – if you stick with organic fertilizer options.22 As an added bonus, organic fertilizers tend to be much cheaper than synthetics. Because it’s incredibly rich in nutrients, compost is a great way to improve soil’s health in every way, from providing crops with the nutrition they need to improving water drainage.24 Some sources suggest that gardeners apply one inch of compost to the top of the soil, while others advise incorporating a few inches of compost deeper into the soil.25 You can make your own compost from kitchen and yard scraps or seek out compost from local farmers. Mulch can be made from a variety of organic matter, including shredded leaves, hay, and grass clippings.28 Applying one inch (or more) of mulch on top of the soil provides a steady stream of nutrients as the mulch decomposes. Many gardeners choose to use mulch in conjunction with compost to create exceptionally healthy soil. When you transplant crops, it’s important to “harden off” any seedlings that you started indoors before planting them in the garden.31 Do this by setting them outside in the shade for an hour or two for the first couple of days, and then gradually increasing their time outside over the course of a week.32 That way, when it comes time to transplant them in the garden, they should be hardy enough to survive the outdoors.